It might sound like a video slot celebrating Wolverhampton Wanderers’ return to the Premier League but Wolves! Wolves! Wolves! is in fact a Native American-themed game from Playtech. The standard action takes places on a 5 reel, 40 payline machine. This can randomly expand to a 9 row set up which offers 100 paylines with expanding wilds. Play on your desktop, tablet or mobile from between 20p and £1,000 per spin. The design in Wolves! Wolves! Wolves! is pretty simple. The reels are set against a snowy wilderness. On those purple reels you’ll see lower value heart, diamond, club and spades alongside a selection of symbols traditionally associated with the Native American theme. In order of value are a tepee, tomahawk axes, an eagle and a horse. The most lucrative standard symbol is the howling white wolf. This spins in stacks that are 2, 3, 4 and 5 symbols high. Land 5 on the same payline and your reward will be 37.5 times your bet. More rewarding still is the totem mask which is the wild. It can land on all 5 reels and performs the usual substitution functions. It also offers payouts of 75 times your bet if you land 5 on a line. The only variation to the base game is the Mystic Totem feature. This can hit at random to expand the number of rows in play. Each new row added also delivers 10 extra paylines. Once the expansion starts, it continues for up to 3 spins. If it reaches its maximum, it will expand to a 9 row, 100 payline machine. Also boosting your winning chances in the Mystic Totem feature are the expanding wilds. Every time a wild hits here it expands to turn the whole of the reel wild. Wilds can land on multiple reels simultaneously which can quickly get the coins moving. That’s it as far as gameplay goes. If you like video slots with a good variety of bonus features then Wolves! Wolves! Wolves! won’t be one for you. This is a very basic game. The expanding game engine and stacked wilds do offer some decent chances. We found the game a little on the dull side overall though. If you like repetitive action Wolves! Wolves! Wolves! delivers just that. If you prefer plenty of extras, Playtech has plenty of options like Raiders of the Hidden Realm. Recommended casinos to play Wolves! Wolves! 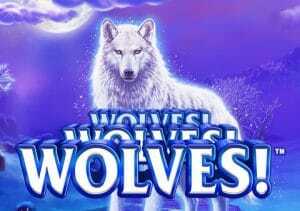 Wolves!